Vouchers "$19 for $55" and "$45 for $115" include product prices, but not shipping costs. Shipping costs depend on the products ordered, delivery zip code and dates. In many cases, frozen products have a cheaper shipping cost than fresh products. Shipping ranges from $27.99 on up, but West Coast orders range from $55.99 on up. Please use our shipping estimator tool on the website to get an accurate cost. Please also know that each order incurs a $9.99 packaging fee to cover the gel packs, dry ice, foil bags, cooler and box. When planning to redeem your voucher, the Groupon price paid never expires, but the promotion does, so mark your calendar with the expiration date written on your voucher. Click here to start the process or read below the pristine picture for more "Groupon Fun Facts." Some delivery dates may not be available due to weather or other delays in shipping in your area. Some areas do not have a Saturday delivery available. Groupons can not be combined with other specials, coupons or Groupons. Please note any Blue Crab order shipped with 2-day shipping requires consumption within 48 hours of receipt. 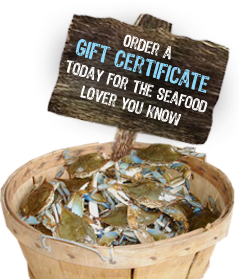 Any 3-day-shipping Blue Crab orders necesitate consumption within 24 hours of arrival. Excessively hot or cold days may postpone all Live Blue Crab orders. Steamed Blue Crabs ship year-round. Estimate the shipping costs by simply adding the products to your cart and entering the zip code and delivery date. Please call 1-800-499-2722 for assistance. For a blog, "What to do with a Blue Crab Trading Groupon..." click here.